On the eve of its Steam Dev Days where it will show off its virtual reality SDK, Valve has launched a beta for SteamVR, which will offer a new way of interacting with Steam via the Oculus Rift headset. The announcement, spotted by Road to VR, was made by Valve programmer Joe Ludwig over on Steam Community, and anyone out there with an Oculus developer model can have a go with it right now - though you'll want to follow Ludwig's instructions carefully. 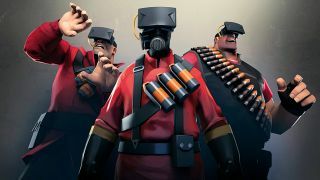 Valve's virtual reality software development kit, which it plans to show this week, will aim to create a standardised interface for VR controls in games. "As of the most recent Steam Client Beta, Steam now supports an experimental VR mode," wrote Ludwig. "If you own an Oculus Rift dev kit you can try it out by starting Steam with '-vr' on the command line. Then press the Big Picture button to enter Big Picture + VR mode." A number of gamers have already taken SteamVR out for a spin. The client lets users view Big Picture mode as if it was floating on a giant screen infront of them. "It looks pretty good," said Reddit user Cunningcory. "It's a giant floating curved screen in front of you. Head tracking works fine. Everything is big enough to read that I've look at so far. Don't try it for too long though – there seems to be a bit of lag in the tracking."